Japanese software industry has been developed centered on "System Development by consignment". So called "SI business". And now, it is at ebb. Naturally, if wealthy sponsors (patron) existed, those outsourcing businesses would survive as well as "Housing" or "Clothing". But on the other hand, in the this aspect of economic recession, the efficiency of business process (Workflow) will inevitable. In addition, we will also have to seek better quality of service. Here we would like to exemplify a Workflow sample concerning the business outsourcing contract for SI company (prime contractor). To contract outsourcing is tough. In particular, fresh project manager cannot be helped from time-consuming on coordination due to lack of knowledge and experience. 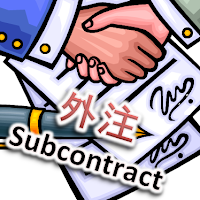 Of course,a project manager must know about "contract" to some extent, and should keep the "rules of the organization" in mind as well. However, still we want him/her to exert the added value as a project manager on "smooth implementation of project" or "Selection of Contractors". 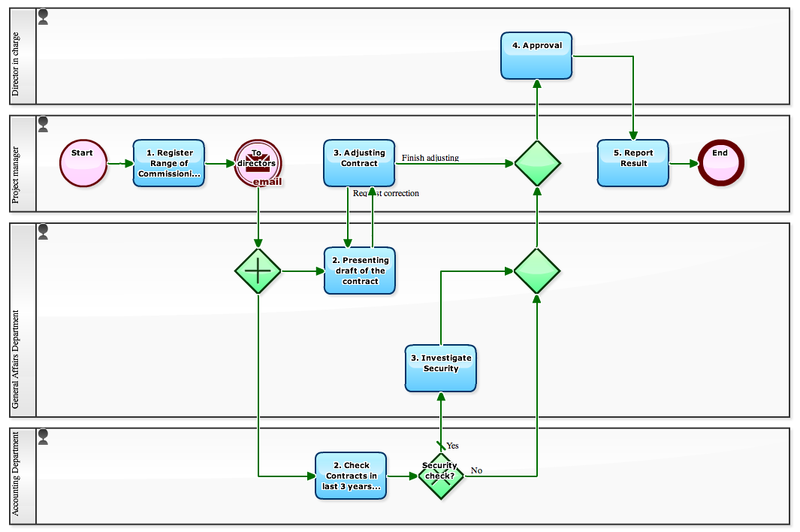 In this Workflow definition, researches and contract documents required for "approval of outsourcing" will be supported by Management Department. One thing to note is, the embodiment of the rule for mutual restraint to prevent injustice and collusion, by the concurrent processing of the Accounting Department and General Affairs Department. And also "logs" would become more worthy, when more of each project were handled according to this business process definition. That is, it enable to see contracts in the past or results of credit of the past, at any time. 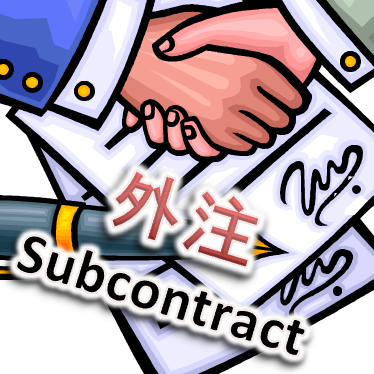 By the way, in Japan, you must pay attention to the constraints by the Subcontract Act (Act against Delay in Payment of Subcontract Proceeds, Etc. to Subcontractors). General Affairs Department also will be required to gather information about the revisions of laws and regulations. "A company in capital more than 50 million yen" outsources production of their Homepage to "a company in capital less than 50 million yen". "A company in capital more than 300 million yen" outsource the development of programs to "a company in capital less than 300 million yen". 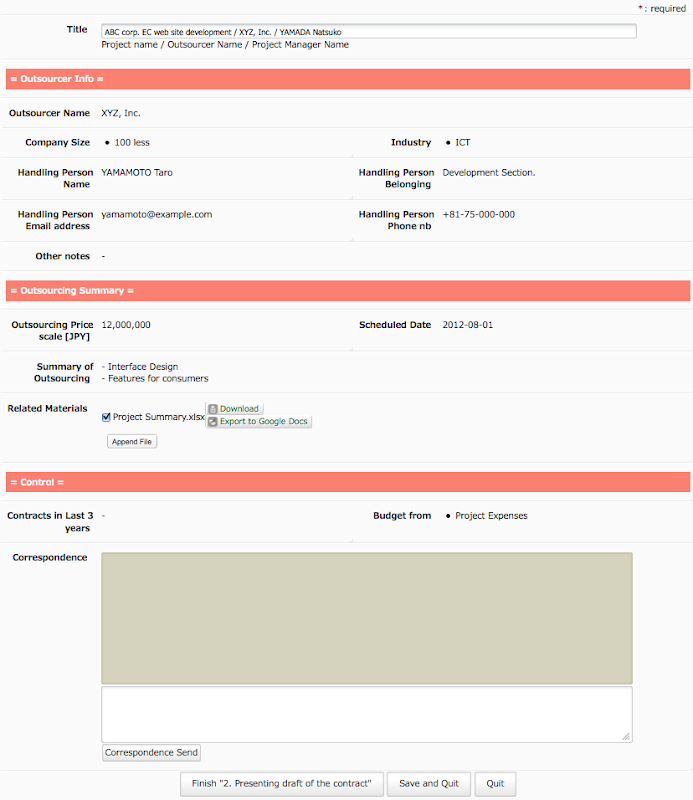 In cases like this, it is necessary that statement of "Payment within 60 days of Date of receipt" is clear in contract.